It is Fresh Friday again and rather than aim for the vegetables, I turned towards fruit. It is fair to say that this week, I’ve been starfruit struck! I’ve had carambola (as they are also called) before but noticed that I’ve never seen anyone else pick one up at the store. Since they were on sale this week, I grabbed two and decided to share it. Starfruit is a very watery tropical fruit with only slight flavor. It compares to a flavored bottle of water that you eat rather than drink. When picking a starfruit, you are going mainly based on color and partially on shape. 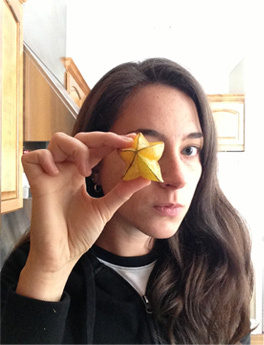 The more even the sides, the prettier looking star slices you get. As for color, they range from green when they are growing to golden yellow when they are very ripe. Try to pick one that is mainly yellow with as little brown as you can (although the edges being brown are normal) that isn’t overly soft. To prepare your starfruit, simply rinse, slice off the brown edges (the thinner you make this slice, the more shape your star maintains), chop off each end, cut into stars and pick out the couple seeds. I’m not doing a recipe for this fruit because it isn’t necessary. Starfruit has far more to do with the presentation and beauty and you run the risk of hurting those superficial attributes by cooking them. I’ve seen people make starfruit chips or a starfruit version of upside cake, which have both been pretty, but I can’t imagine that it would add much to a recipe because the taste is so minor. Instead, try to get creative. The shape lends it to being a very kid-friendly fruit. I stuck one of my slices with a skewer to make a wand because let’s face it, fairies are the fantastic. The stars could easily be displayed to look like a comet. They could also be used in magic, planetary, fairy, princess, movie, Disney or other whimsical themes. For adults? Why not brighten up a plate of fruit or decorate a cocktail glass for an Oscar party? From topping cupcakes for kids, salads for adults or making playful kabobs for every age, this star shines with versatility. For Kids And Kids At Heart, Like Me!